Dancing with the Stars champion Mairéad Ronan has said she could feel the support from the mums of Ireland on Sunday night's finale. 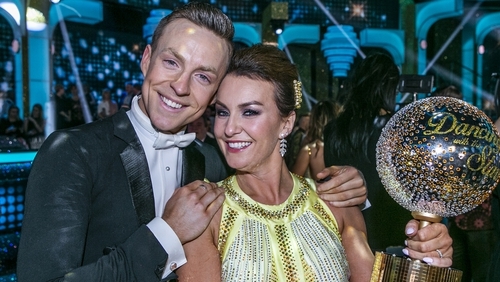 Mairéad and her professional dancing partner John Nolan were crowned the winners of the third series of DWTS Ireland, having danced against actor Johnny Ward and his partner Emily Barker, and singer Cliona Hagan and her partner Robert Rowiński for the glitterball trophy. Speaking to RTÉ Entertainment shortly after hearing her name called out, Mairéad said, "I think the mums of Ireland got behind me tonight; I felt that tonight." Mairéad said the show has had a huge impact on her as a person, " Doing the show has done so much for me personally; my confidence was on the floor when I met John, my baby was three months old, I was breastfeeding and tired and I had loads of self-doubt and my husband pushed me to do it, and then I met John, so I was going between two very brilliant, gorgeous, strong men who were backing me all the way." The presenter said if she could go back and tell herself something 12 weeks ago, knowing now that she has won the competition, it would be to back herself more. "Back yourself more often, that's what I would say to myself, because I really haven't," she told RTÉ Entertainment. "I was saying to John that I have never ever won anything personally. I can get deep here and go through school years – I never won an award – I've been part of teams that have won awards before, but my name has never been on them, and they've been brilliant. "But to hear my name called out tonight is… I'm just so proud and it's going to be great to show my little girls this, my son was in the audience, but to show my little girls…"
John said that winning the show is like a dream. "When we heard your name I thought I was going to collapse," he said. "I went into total shock." "For me, as a dancer, a pro dancer, this is what dreams are made of. I've watched this for years and now to say that we won," he added.